A friend swapped me The Adventure Zone graphic novel in return for him reading Illuminae. I had never read a graphic novel before and I have never listened to the podcast on which this book is based. 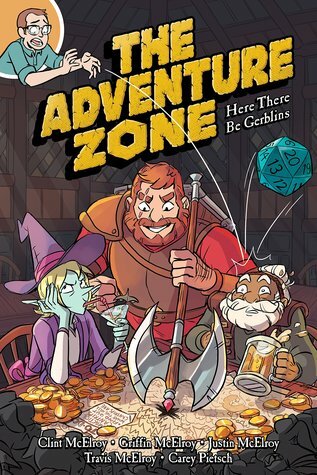 This post will not only be a review of The Adventure zone, but also of the graphic novel format. I found this book to be quite entertaining and enjoyed how it related to the game of dungeons and dragons. The information is given about each character and the occasional out of story (play?) conversation was helpful and done in a way that reminds you of the context of this story. I also felt that it made the endless side quests and unnecessary deviations more tolerable as it felt like something you might do when playing a game. The characters seemed to be confused and often traits were added in when they became convenient to the plot. Some of this was called out in the story but I found the joke got old quickly and became annoying. The characters seemed quite flat and uninteresting and ultimately forgettable. I found that reading a graphic novel was quite annoying as it was harder to work out what was going on. Some of the speech was hard to decipher into conversations. I also found that the order of the panels was quite hard to work out. Overall I would be reluctant to read another one any time soon.